"The arms of a period are often an illustration of technology meeting intricate design and executed artistry. Rifles, pistols, swords, knives, powder horns and more all make up the rich decorative history of American arms. If there is an example of this category you are looking for and do not see, please call or email, we may not have cataloged it yet." 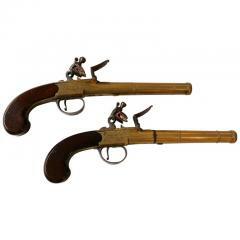 Wonderful pair of Queen Anne brass cannon barrel pistols made in London and marked Bunney for Joseph Bunney of Birmingham and London. 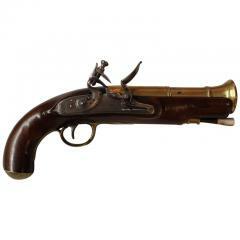 18th century English silver mounted pistol with 8" brass barrel marked London.Made by William Grice a noted English Gunmaker most known for supplying some of the first rifles used by British forces in the American revolution. 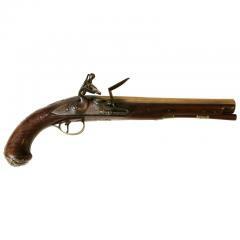 Very rare brass barrel blunderbuss pistol signed on top of barrel J. Finch N. York with walnut stock original lock made by Sharpe and retaining its original belt strap. 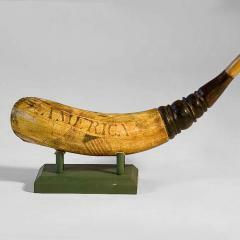 Powder horn with engraved American eagle, ship, flag, shield and the name “AMERICA” designating the ship. The ship was launched in 1782.